Not only can’t I believe that we are half way through 2016 but also that the kids are now on school holidays. EEEkkk! School holidays are mixed blessings for me. I love not having that ‘gun to the head’ pressure of rushing to get out the door by a certain time like there’s a full scale emergency complete with sirens and flashing red lights with the neighbours looking on musing “There goes that crazy mother again…” No more packing of school lunch boxes and rushing the kids to an inch of their lives. I’m sure all mothers can relate. Now for lazy cosy sleep-ins (if the kids let you!) and simply letting kids be kids. The flip side is that order and routine goes out the window and the house looks like a cyclone has hit it well before mid day. And of course juggling the competing needs of work and kids, and trying to be present to both while feeling like you are not doing justice to neither! Let’s be real, the modern mother has challenges our female forbearers did not. They are different in nature, not harder or easier, just different but, I think, more complex. For me, summer holidays are an easier beast to tackle, despite their length. The default in summer in Sydney is making a bee-line to the beach and spending the day there. It’s a no-brainer, especially with so many stunning beaches at our door step. Kids and adults alike can spend countless hours in the presence of 3 simple magic ingredients: sun, surf and sand. It’s the best on every level (especially for an ol’ Gold Coast chick like me!). Winter, trickier. I used to make the mistake of loading my kids with back to back activities fearing that “they will get bored” unless there was a scheduled activity each and every hour of every day. But truth be told, while there certainly is a time and place for structured activities, I think school aged kids (especially mine) just love hanging around the house, playing with their toys and games that they rarely get a chance to do during the school week with all their dreaded homework. Relaxing, resting, being creative with drawing and paints, art ‘n craft, playing card games, marbles, back yard trampolines, building with Lego, reading books and playing their imaginary made up games. Simply giving them the space to entertain themselves and then checking in with them every so often to see how they are going or to join in if I’m so inclined, is not a bad thing. Here is an article I read a few years about why unstructured time is so important for your child’s healthy development. Visiting our local library to borrow a stash of new books including talking books….these are a great alternative to screens! Ice-skating at Bondi outdoor iceskating rink as part of their annual winter magic festival. There’s also one in the city neat St Mary’s Cartheral. A little small and hectic, but good to do once. Visiting historic buildings like Vaucluse House, Elizabeth Bay House or the QVB in the city. My kids and I love the rich history these buildings afford. Check out the Metropolitan Museum of Art shop in the QVB and the tea room on level 1 with their exquisite tea cups and pots! Art gallaries especially The Art Gallery of NSW or the Museum of Contemporary Art in the City (then coming home and drawing or painting with the inspiration from the morning outing). 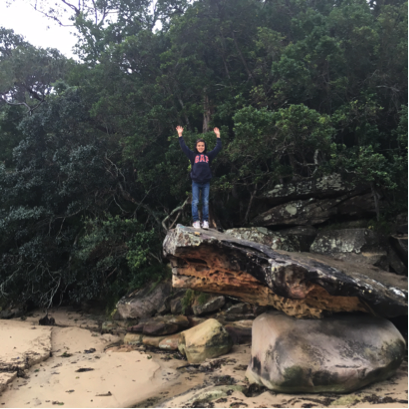 Coastal walks… enjoy the fresh coastal air and the stunning views at our doorstep eg Bronte to Bondi, Bronte to Maroubra, Northern beaches, Middle Harbour to Manly. I am excited to be co-presenting this talk with Anthia Koullouros, renowed naturopath and founder of Ovvio Organics, on a topic that is near and dear to our hearts: curbing sugar cravings. Both Anthia and I think that this is a topic that many people in modern society will benefit from as both of us see this come up a lot in our consultations with clients. • Why we crave sugar? • How to curb sugar cravings? • Why eating a wholefood diet eliminates the craving for sugar and snacking? • Healthy alternatives to sugar. • Healthy snacks and treats. • Detailed discussion on how to curb sugar cravings. • Expert advice from experienced naturopath Ovvio Organics founder Anthia Koullouros, and founder of Star Anise Organic Wholefoods and Broth Bar & Larder Soulla Chamberlain. • Tea Tasting by Ovvio Organics. • Those who are looking to curb their sugar cravings. • Those who are looking to transition from eating processed foods to whole foods. • Those wanting no-nonsense advice on choosing and cooking real, honest food. • Those who are wanting food, health and wellness inspiration. When & Where: There are 2 dates with 2 different venues for this talk. 1. Text Soulla Chamberlain on 0407 871 884 to confirm that there are spaces available (spaces strictly limited). My organ meats workshop for Wed 3rd August is fully booked but there are a few spaces left for the workshop on Wed 10 August. By incorporating a few different organ meats into your diet you can really can take your health to the next level. Organ meats are what I call one of the 3 foundational foods (along with bone broth and fermented foods) that have served mankind for millennia but have fallen by the wayside in modern society in recent times. My mission is to bring nutrient-dense traditional wholefoods, like organ meats, back to the modern table by educating people (especially time-poor parents!) on how to make them simply, easily, deliciously and affordably. To book and for further information click here. I am delighted to see that our little artisan carob bears are being wholeheartedly embraced by young and old. And who wouldn’t love these little fellows?! The impetus for crafting these was the lack of a healthy carob bear on the market. I’m not a fan of milk powers nor soy lethicins, so I wasn’t happy giving products containing these ingredients to my children. So as not to feel deprived, I promised my kids I would create my own. 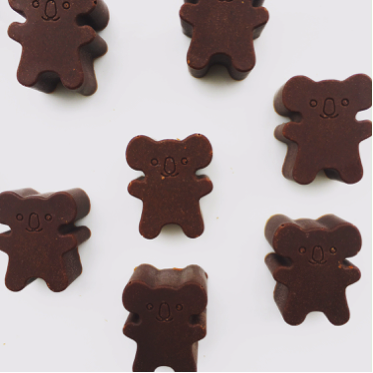 Our carob bears only contain 2 pure ingredients: carob power and raw cacao butter. That’s it! We think carob is naturally sweet enough and doesn’t require any additional sweeteners. Carob also doesn’t have the stimulatory effects of raw cacao powder so better for little ones especially near bed time! I also have many clients who can’t tolerate the theobromine in raw cacao powder so this is an alternative treat for them. Raw cacao butter is a source of healthy fats, gives that melt-in-your-mouth cholocately smoothness and helps to slow down the release of blood sugars from carbohydrates. Both ingredients are certified organic and with no added sweeteners these are truly no guilt treats. Sold individually or in a pack of 2. Also sold at The Health Emporium. Stay tuned for our new peppermint carob bears about to hit the market soon!! “Oh EM Gee!” as my 8 year old says. We are wanting taste testers for this new mint variety so please pop into Broth Bar & Larder and tell my friendly staff that you have signed up for the role as official taste tester of the new peppermint carob bears. What a burden, I know ;-) My staff and kids gave them the big thumbs up but I would LOVE your feedback too! Our latest soup offerings at Broth Bar & Larder are a chicken noodle soup made with rice noodles, chicken stock, chicken pieces off the bone, sliced kale and leek. All ingredients are certified organic and we only use filtered water in all our products. We also have a completely grain-free version made with spiralized angelhair zucchini “noodles”: a simple chicken zoodle soup that has proved so popular with not just little ones but adults too. This is a little more substantial than a simple cup of broth but less hearty than one of our other 6 signature soups or the meal of the day. At the moment these are offered as dine-in or take-away options only at Broth Bar & Larder. I would be interested to know if you would like them also available pre-packaged and frozen like the rest of our soups? If you follow me on social media you will see that I regularly post photos and descriptions of what I pack for my 2 monkeys to take with them to school for lunch and morning tea. I often use stainless steel lunch boxes with dividers to separate the various contents of their lunch boxes. I also use insulated containers to keep food warm (e.g. casseroles, soups) or cold (e.g. yogurt). I also use smaller containers of various sizes for morning teas and to house dips, nuts & seeds, nori strips, fruit, cheese, cured meat etc etc. 1. Stainless lunch boxes with REMOVABLE dividers. You can remove the divider when packing a salad or sandwich or other meal that doesn’t require compartmentalisation. This makes washing the container easier too than the ones with permanent dividers. 2. A nesting trio of 3 round containers of various sizes with coloured lids. These are so handy. 3. Insulated containers for keeping food warm or cold. My trick to keep food warm is to pour boiling water into the container to really warm it up for 5-10 minutes. Then tip out the water and add the hot food. To chill food, place container in freezer before hand. 2. Through our online store. We deliver dry goods Australia wide and refrigerated items to Sydney and Wollongong. At this stage only the Star Anise Organic Wholefoods products can be purchased on our online store and not third party products like lunchboxes, Red Boat sugar-free fish source, fermented cod liver oils, raw milk cheeses, wild Canadian salmon and tuna, GelPro gelatin and collagen powders, olive oil etc. I aim to include include these their party products in our online store in the coming months. 3. By emailing orders@staraniseorganic.com and you can either collect from Broth Bar & Larder or we can ship to you as above. 4. At various stockists (note that not all stockists stock the entire range of our products. Best to call ahead to confirm if they have what you’re after). We warmly welcome Lettuce Deliver as a new stockists to the Star Anise Organic Wholefoods family. Lettuce Deliver is one of Australia's longest running organic food home delivery services. They are a family run business specialising in the delivery of CERTIFIED ORGANIC produce and products across Sydney to most areas twice a week. Funnily enough this story goes full circle. I started using Lettuce Deliver 10 years ago when Will was a bubba. Being new to Sydney and dealing with the struggles of being a first time mum I turned to an online organic delivery business (recommended by a mother in my mothers’ group). I thought their name was pretty cute too ;-) They were my online one stop shop as they sold so much more than just produce- from bones, to organ meats, raw milk, pantry items and personal care products. And more than that they really care. I received a phone call from Ben one day “Um, Soulla, I just dropped off your delivery and left it on your kitchen bench. Do you often leave the house with the door wide open?" Response: “Ben, as a sleep-deprived frazzled mother of 2 young children without family in Sydney, that is the least of my shenanigans”. Who would have thought that 10 years on I would now be supplying my products to them to include in their range. They are stocking a selection of our activated nuts, date coconut balls, broth (beef, chicken and veggie), broth based soups, choc power bars, sokolata (raw dark chocolate), sage & thyme chicken liver pate, and fermented veggies. The full list of our stockists can be found here. For enquiries about becoming a stockist please email info@staraniseorganic.com. Or if you have a local organic or health food store who you think might like to stock our products please ask them to contact me directly. Kingsleys Meats (located at 22 Plumer Road Rose Bay) have had a name change to Kingsmore Meats and have opened up a second new location at The Saporium, Sydney’s newest food destination at 61 Mentmore Ave Rosebury. 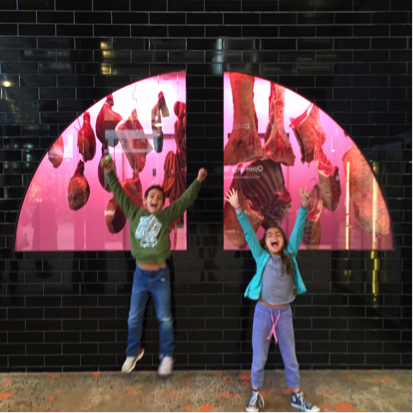 They are a family owned and run artisan butcher, selling superior quality pastured meats sourced from small independent local farmers who raised animals naturally, humanely and sustainably. They will be stocking some of our product lines in the coming months. We wish them all the best with the new location. The Saporium is also home to Wholefoods House (who stock our broth and activated nuts). The Saporium also has a market every Saturday. A new raw (unpasturised) milk recently hit the Sydney market that is allowed to be sold for consumption purposes. Currently raw cow milk is prohibited from being sold in Australia for consumption purposes. It can only be sold for cosmetic purposes e.g. Cleopatras bath wash. This new milk, produced by a NSW start-up called Made by Cow, is able to be sold for human consumption on the basis that it is ‘pasteurised’ not through traditional heat methods but through high water pressure. Approval from the NSW Food Authority involved a rigorous 2 year process. A. The upshot is that they only test whether half a dozen or so specific pathogenic bacteria exist in their milk after high water pressurisation. Because they do not test for the presence or absence of beneficial bacteria or enzymes they can not say with any certainty what happens to them. Now if high water pressurisation is powerful enough to destroy certain pathogens should they ever be present in raw milk, then one would presume (but can not be certain without any lab testing) that that process would also destroy at least some of the beneficial bacteria and even possibly enzymes. Saxon conceded that that is probably the case in respect of beneficial bacteria and could not say what the position was regarding enzymes. And that is my concern. So on the basis this high new high pressure processed milk presumably does not contain as many beneficial bacteria and possibly enzymes as completely raw milk, it would not on that basis be as health promoting as a completely raw cows milk that has not been treated or processed in any way. However, Australian law forbids me for recommending the consumption of a truly raw unprocessed cows milk. What people do in their own homes is, of course, up to them. Q. What are the cows eating? The cows are fed exclusively grass except when they are being milked when they are fed grains (wheat and barley). Note- This is not dissimilar to Cleos. Q. Are any petro-chemical fertilizers used in the soil? Q. Are the cows administered antibiotics? A. No they are not routinely administered antibiotics. If they are given antibiotics, that cow’s milk is discarded. Q. Is the plastic bottle the milk comes in BPA-free and food grade? I think this new milk definitely is a far healthier alternative to your standard heat pasteurised cows milk that most people are drinking which heats the milk to such high temperatures that ALL enzymes and beneficial bacteria are destroyed. This new cows milk is also unhomogenised and for that reason alone is far healthier than your standard pasteurised and homogenised milk. Homogenisation is a very outmoded concept that forces fat molecules to be evenly dispersed throughout the milk through a chemical process to avoid us lazy Westerners from simply shaking the bottle. Fat naturally rises to the top of protein so that’s why raw milk naturally has a layer of cream on the top. Ask your grandparents or even parents and they will tell you that’s how they found their milk in days gone by. All you need to do is shake the bottle to evenly disperse the cream throughout unhomogenised milk. Secondly I think that this is a terrific product for food and beverage businesses (like mine) to use in their commercial kitchens for recipes incorporating milk. Because Australian law forbids me to use raw milk like Cleos in my business, I now have a legal alternative that I could use if I wanted to offer, for example, hot drinks or smoothies made with dairy. In terms of the taste, I couldn’t really tell the difference between this new product and Cleos (note that I can only recommend Cleos for cosmetic and not consumption purposes so taste testing was at my risk). This new milk, while more expensive than Cleos, does have a longer shelf live (21 days). For these reasons I commend Saxon for his commitment in bringing this product to the Australian market. I definitely think it will provide Australians with a healthier choice for dairy milk than any of the pasteurised milks on the market. For more information about the high water pressure process read this article. Star Anise Organic Wholefoods is expanding under the pressure of increased demand and we are seeking more kitchen hands to join our ever growing and dynamic staff at Broth Bar & Larder in Bronte to do the early morning shift starting from 5 or 5.30am working up to 38 hours a week Monday - Friday. The work is physical and involves making and/or straining our signature bone broth and producing our other artisan organic wholefood products. have a sense of humour and take life's vicissitudes (aka f%#k ups) in their stride. If you think you fit the bill, or know someone who does, contact me 0407871884. Sydney has had an icy blast over the past couple weeks. Being a Gold Coast girl with Mediterranean blood, the cold isn’t my friend. Over the years I’ve fine-tuned sustainable and healthy ways to stay warm down to a fine art. Read this previous blog post I wrote that sets out my 8 favourite ways of staying warm over winter. At this time of year I see many people with common colds, sniffly noses and sore throats. You might like to read this previous post I wrote about what’s in my medicine cabinet to alleviate common colds and sore throats. In addition to the things listed there I would now also add pure essential oils such as Young Living which are reputed to be the most potent and pure on the planet. I add a few drops into the bath, in a diffuser and in a bowl of steaming water to inhale. For common colds I use eucalyptus oil and peppermint oil, and blends like Thieves and Purification to clear the air of pathogens. DoTerra’s EasyAir is also a great blend. I DO NOT RECEIVE ANY COMMISSIONS, FREEBIES OR KICK BACKS FROM ANY SUPPLIER. I SIMPLY PROMOTE BUSINESSES WHOSE PRODUCTS OR SERVICES I PERSONALLY USE AND WHO HAVE A SIMILAR ETHOS TO MINE. MY BLOG STARTED OVER 6 YEARS AGO AS A WAY OF EXPRESSING MY LOVE FOR REAL FOOD AND THINGS THAT MAKE ME TICK. I LOVE SHARING WHAT I KNOW. I HOPE YOU ENJOYED READING THIS NEWSLETTER. The days seem to be flying past at super sonic speed and I find it hard to believe that we are fast approaching winter! I only just managed to squeeze out my May newsletter in the last days of May! Eek! So much for organisational skills. Here’s a brief run down in the world of Star Anise Organic Wholefoods over the past month. As we have discontinued our brothsicles over the winter months (and are limiting them as a summer treat only) we have launched for winter our range of panaccottas made with GelPro beef pastured beef gelatin, coconut milk, maple syrup and a flavour: either raw cacao or vanilla bean powder. We hope to launch other flavours such as strawberry and mango. Sold in 100g glass jars, these are a no-guilty healthy dessert. The raw cacao one tastes like a chocolate custard. Yes please! I am really excited about offering a range of cured meats and beef jerky at Broth Bar & Larder. Preparing my kids’ school lunch boxes instantly became a heck of a lot easier and a little more diverse. Through my daily social media posts and my School Lunch Inspiration ebook I aim to provide parents and carers with ideas for quick, easy and simple lunch boxes made with nutrient-dense whole unprocessed foods that are delicious and bursting with flavour. This is part of my broader mission to inspire parents to raise vibrantly healthy children. To that end, the first and easiest place to start, and the place that has the greatest impact, is diet. By making products such as cured meats, beef jerky, raw milk cheeses, coconut yogurt, slow cooked casseroles and broth-based soups more accessible to parents, my hope is that school lunches become more of a pleasure and less of a burden. Some cured meat or beef jerky teamed with veggie sticks makes for a really quick and healthy lunch box. A piece of fruit and a slice of raw milk cheese or thermos of coconut yogurt is an easy morning tea. A thermos of soup, bolognaise with zucchini noodles or warming casserole is easy to heat up on school mornings and well received by kids. We are selling the following selection of pastured pork products from Bundarra Birkshires: Little French Ham, Capocollo, Lonza, Smoked Ham, Pancetta and Bacon. These are made without any preservatives or nitrates. Another quick and easy school lunch box inclusion is pastured beef jerky made by Kooee All Natural Snacks. Made from 100% grass fed free range Tasmanian beef and spices without any sweeteners, gluten or artificial crap. I met the producers at an organic expo recently and was inspired by their the story on back of their packets which recounts that “It all began on the trail…” in search of a healthy snack. As I am an avid bushwalker and lover of the great outdoors, this instantly struck me when I read it. I hope you love these new products as much as my kids and I do! You asked for single portion wild samlon fillets, and we delivered. The feedback I received from many of my customers is that the salmon tails, while more economical, were too large a size to get through especially for a 1 person household. Salmon from The Canadian Way is the only true wild salmon in Australia (other than the salmon you can buy in tins from supermarkets). The rest is farmed and the problem with that is the cramped crowded conditions in which they are farmed and what farmed fish are fed (antibiotics, soy pellets, colour dyes are injected into salmon to give it that pink colour). All this breeds illness and disease which is passed on to humans which eat diseased fish. You can read more about wild versus farmed in a previous post here. Wild salmon (and tuna) from The Canadian Way has an unparalleled omega 3 to 6 ratio making it one of the most anti-inflammatory foods on the planet. Because it is so high in omega 3 polyunsaturated fatty acids, it should be prepared in a certain way to prevent these extremely heat sensitive fats from oxidizing. I will be sharing my favourite ways to prepare and eat wild salmon in my future posts soon. The Omeio has relaunched their online store. Omeio is an online store dedicated to providing and delivering a curated selection of fine artisan food. Their mission is to only offer a small selection of what they think is the most premium quality local organic artisan products so as not to overwhelm the consumer with too much choice. We are truly honoured that Omeio have selected our products as fit for their online store. The full list of our stockists can be found here. Last weekend I attended the annual MINDD International Forum organised by the MINDD Foundation. To be immersed in 3 days of lectures on the latest research from Australian and International speakers and to meet and connect with practitioners, fellow mums, artisan producers, colleagues, customers and clients was such a rich and rewarding experience. My team and I supplied all of the bone broth and sauerkraut for one of the Food is Medicine lectures and the first meal off the plane for all of the International and Interstate speakers. · Even on the best diet, probiotic supplementation is still necessary in times of stress in our modern world. · We should stool 3 times a day. Anything short of that is considered constipation. · I have a big crush on psychiatrist Dr Kelly Brogan, author of A Mind of Your Own, and her holistic approach to depression and mental illness. She no longer prescribes medication to her new patients in her practice. In her words “The seat of health is in your gut”. · There are more lifestyle factors that affect the gut microbiome than I knew of including exercise, wearing shoes and mercury fillings. I talk more about these in my fermentation workshops (see below). My fourth and final fermentation workshop for the year will be run on 8 June. There are only a couple spots left. To book and for further information click here. After that the next round of workshops is organ meats and bone broth. By learning how to make your own bone broth, cook organ meats and make a few of your own ferments, you really can take your health to the next level. If every household did this like in the days of yesteryear, we would have a very different health care system in this country. I call these my trifecta of workshops and I encourage everyone to come to them. They are foundational foods that have served mankind for millennia but have fallen by the wayside in modern society. My mission is to bring these nutrient-dense traditional wholefoods back to the modern table by educating people (especially time-poor parents!) on how to make them simply, easily, deliciously and affordably. I hope to see you at one of my workshops soon! If anyone is interested in being a helper at one of my workshops please contact me at info@staraniseorganic. The helper comes to the workshop for free, obtains all the leanings and the workshop booklet in return for assisting with greeting the arrival of clients and helping to clean up throughout and at the end of the workshop. It is a small way of giving back to the community especially for those who would love to attend one of my workshops but may not have the financial means to do so. I especially encourage this for students studying health and nutrition. We will be closed Monday 13 June for the Queens birthday long weekend. we are excited to announce the following new products! We have frozen our beef broth (without added salt) into ice-cube sized portions for you to conveniently pop a cube or 2 into smoothies and sport drinks for extra nutrient-density and frothiness (without affecting the taste at all!). Any which way to sneak in our beloved bone broth into little bellies (big ones too!) is a winner. You can also add these cubes to sauces, stews and baby’s food for extra nutrient-density and liquid. Our beef broth is long slow simmered using certified organic bones from 100% grass fed & finished cows raised on sustainable Australian farms. Our broth is truly unique because it was formulated in consultation with an integrative GP, a wholefoods dietician and naturopath to be completely free of FODMAPs and low allergenic as possible. I have been adding 2 cubes of frozen beef broth into my morning smoothies for almost 10 years. I started blogging about it in 2012 here and started teaching people how to do it when I started running my bone broth workshops 5 years ago. Earlier this year a customer walked into my workshop and said “You know Soulla, you really should start selling your frozen beef broth cubes”. So the idea was born but didn’t become a reality until recently as life got in the way. I’ve had tremendous response to this new product to date. It can be purchased directly from me or selected stockists such as The Health Emporium in Bondi, Foodies in Peakhurst and All Good Things Organic Market in Wollongong. The retail price and list of ingredients can be found here. Scroll down to read my nutrient-dense smoothie recipe! We crafted this vegetable stock in response to a number of requests over the years and more recently. This stock is made by long slow simmering certified organic vegetables and dulse (a sea vegetable). This provides for a mineral-rich and intensely flavoursome vegetable broth. Suitable for vegetarians and vegans or those wishing to consume more nutrients in their diet. Some of my meat-eating friends drink veggie broth in place of water for parts of the day to up the nutrient-density ante. After all, vegetable broth can be thought of as nutrient-dense water. My 7 year old daughter is in love with my vegetable stock and asks for it. There must be minerals in there that her body is somewhat lacking. She loves taking it to school in a thermos container. Click here and scroll down to the bottom of screen for the retail price and list of ingredients. We also hope to launch a heap of new products in the coming weeks and months including veggie chips (salted or spicy), brothsicles (broth-infused ice blocks) made with Ovvio Organic teas or coconut milk based, gluten-free crackers, kale chips, spicy activated pumpkin seeds, spicy activated cashews, a gluten-free breadcrumb mix and ready-made casserole meals with root veggies and 100% pastured meat or chicken. Yes we have been busy (and that’s not the half of it!). I can’t wait to share these new products with you! My passion is creating new products which don’t exist in the market or the quality of which is lacking. The products that I make and sell are IDENTICAL to the ones I make at home for myself and my kids. The same ingredients are used and the same preparation methods are employed. Our products are completely free of gluten, refined sugar, industrial seed oils and tap water. For these reasons and more. I believe our products are truly unique in the marketplace. I wanted to take this opportunity to thank all of my long-standing customers for your loyal support and for all of our new customers – your feedback and support has been touching and greatly appreciated. + 1-2 raw pastured egg yolks (optional). Not the whites! To understand why egg whites must NOT be consumed raw read one of my earlier posts here. + choice of flavours: 2 tsp raw cacao powder, 1/4 tsp vanilla bean powder, 1/4 tsp cinnamon powder, pinch of nutmeg, 1/4 cup berries or 1/2 fresh mango. Leftovers can be poured into ice-block moulds and frozen to make brothsicles! You may like to increase the sweetener if freezing. Our fermented veggies have recently had a make-over with new glass jars. We will update all of the photos on the website in the coming weeks but for information about prices and ingredients click here! I recommend up to ½ cup of fermented veggies be consumed per day. I have a heaped tablespoon or 2 as a condiment with eggs for brekky and I throw some into my salad at lunch. Packed with probiotics that proliferate as a result of the wild fermentation method, home-made fermented veggies are a must for robust gut health, immune function, skin and oral health, brain function and metabolism. This institution of 18 years in South Bondi (opposite icebergs) is now stocking our activating nuts….the perfect summer beach snack–attack! Enliven Organics is a online Sydney-based organic food delivery service. Enliven Fitness Studio offers a holistic approach to your health, fitness and weight loss goals. They are located at 327/308 Wattle Street, Ultimo, NSW 02 8203 4598. Follow them on instagram @enlivenfitness. They are selling a selection of our date coconut balls, power bars, broths, broth-based soups, chicken liver pate, kombucha and beet kvass. Congratulations Sophie Henley for opening up her third Henley’s Wholeoods in under 2 years: first in Bondi Junction which I blogged about here, then in Alexandria and now in the Intercontinental Hotel, Cross Street, Double Bay. We are in love with your work and your contribution to the wholefoods scene in Sydney. All food in made on the premises. Sophie is meticulous about the source and processing of what she offers customers. Yet another amazing clean eats place for brekky, lunch and snacks. + They age their own beef. + They make their own biltong and bacon. + The cured meats are from Pino’s Dolce Vita Fine Foods. + Some sausages contain breadcrumbs and some are grain-free. Please ask! + They hope to sell a range of organ meats and bones too in the near future. In the meantime, these can be specially ordered. + They only use filtered (and not tap) water in their products. Go check them out. We welcome them and wish them every success! If anyone has any lingering concerns about the consumption of red meat following the recent WHO report, I suggest you read Chris Kresser’s response here and/or Mark Sisson’s response here. "Mama, what's so bad about vegetable oil?" my 7 year old happen to ask me on the day that an article in the Sydney Morning Herald appeared highlighting the dangers of vegetable oils. The article summarises that "Cooking with vegetable oils releases toxic chemicals linked to cancer and other diseases, according to leading scientists, who are now recommending food be fried in olive oil, coconut oil, butter or even lard." 1. they are extremely high in omega 6 polyunsaturated fatty acids which cause inflammation, and inflammation in turn is the root cause of all (yes all!) modern disease including cancer, cardiovascular disease, hormone disruption, mental health problems including violent behaviour. This is all backed by robust scientific studies. 4. they are not heat stable yet they are used to cook with further denaturing the heat sensitive omega 6 fats. 5. they are particularly damaging to children and unborn children according to Dr Catherine Shanahan in her book “Deep Nutrition: why our genes need traditional foods”. P.S. vegetable oil doesn’t actually contain any vegetables!! But it’s a great marketing name, right?! Most restaurants and all fast food chains cook in vegetable oil because it's so damn cheap. Rethink store-bought deep fried foods in particular! So where should we eat out? Read this and this. Cook more at home! Make your own chips with coconut oil. Kids love this especially if you get them involved! Read the labels on all packaged goods- if it contains vegetable oils of any description ditch it! Life's too short and you and your kids are too precious to eat crap oils. Opt for the delicious healthy fats that your great grandmother cooked in: butter, tallow, lard, ghee or coconut oil. Our bodies (esp brains!!) need saturated fats from natural sources to grow and function properly and to perform our best. Why settle for anything less?! A few years ago I wrote a post on Dr Kate Norris being one of the handful of integrative GPs in Sydney who I highly recommend. She is on exactly the same nutritional and lifestyle page. A couple years ago she left for Victoria but now she’s back and practising in Bondi Junction. For me it’s imperative that all of my health care professionals (from my dentist, GP, osteopath and naturopath) are on exactly the same nutritional page and speak and understand my language. It’s reassuring to know that, at least in Sydney, such people exist. We welcome Kate back! I recommend you check out her brilliant website here. The other utterly brilliant integrative GP who I work with and highly recommend is Dr Min Yeo, also based in Bondi Junction. For recommendations on GPs further afield, please contact me directly. A few months ago I had promised to run a heap of cooking workshops in the latter part of the year. Unfortunately I am not able to do that at present as a unique and exciting adventure has presented itself to me rather unexpectedly. Given the enormity of what’s involved for my business, I need to throw much of my energies into that. I hope to be able to reveal all of the details very very soon! Workshops will resume in 2016 in full swing!